From left to right: HFC’s Chef de Cuisine Joseph E. Cosenza shares some cooking tips with FOX 2 anchors Ryan Ermanni and Derek Kevra. 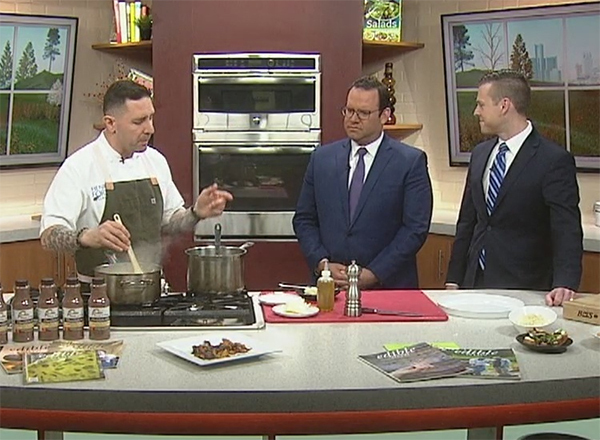 HFC’s Chef de Cuisine Joseph E. Cosenza appeared on the April 15 edition FOX 2’s The Nine morning show, where he prepared risotto cacio e pepe for anchors Ryan Ermanni, Derek Kevra, and Deena Centofanti. Cosenza also spoke about the HFC Culinary Arts program’s scholarship fundraising dinner Thursday, April 25, at 5:30 p.m. in the Fifty-One O One student-run restaurant, located in the Student & Culinary Arts Center (Bldg. M). Tickets for this event are $80 and are available here. HFC is partnering with Edible WOW, Sandhill Crane Vineyards, Calder Dairy, White Pine Coffee, and Tito’s Handmade Vodka to host this scholarship dinner. For more information, visit www.henryfordculinary.com.